Catch what you missed or revisit one of our shows. We are so excited to bring you our next concert Either Or with the world-renowned soprano Allison Bell. Allison is joining us for a unique one off Australian appearance in La Plus Forte. Based on Strindberg’s The Stronger it embraces the dramatic tonal language of Irish composer Gerald Barry. Alongside La Plus Forte will be the cutting edge electro/acoustic works of Australian composers Erkki Veltheim, Leah Blankendaal and Cat Hope. La Plus Forte is a solo opera about two women who sit in a cafe, one silent, the other (Madame X) anything but. As X suspects Madame Y had an affair with her husband she becomes increasingly hysterical. In this remarkable one act operatic monologue, who is the stronger: X, with her elevated social status, or Y, who remains silent?. electro/acoustic works of Australian composers Erkki Veltheim, Leah Blankendaal and Cat Hope are inspired by the exploration of infants’ babbling accompanied by Bach, to distilling sonic sounds through an Ipad, to work inspired by the literature of Maggie Nelson. This program will once again take Adelaide audiences to the leading edge of opera and Australian chamber music. Allison Bell (find out more) has been described as a ‘superbly controlled and lucid soprano soloist,’ with ‘a natural, expressive fluency’. ALLISON has gained a global reputation as one of the most exciting exponents of 20th and 21st century music. In this world premiere version for soprano and piano, Barry embraces the powerful dramatic and musical elements of Strindberg’s text. This role is so exciting to bring to life! One simple scene but such a fiercely intense and complex snapshot of life and the human experience that everyone can relate to. For me Gerald’s music is the perfect lyric expression of this experience and it does so with uncanny precision. His music is so potent in its expressivity and characterisation – the seeming naïveté, the playfulness, audacity and at times, violence – it has a great originality and freshness that fits these great dramas. Gerald Barry’s one act opera, La Plus Forte, was commissioned by Radio France for the 2007 Festival Présences. It is a monologue based on Strindberg’s play, The Stronger, about a woman, Madame X, meeting a younger acquaintance, Mademoiselle Y, in a cafe, and through a conversation, wherein only Madame X speaks, it transpires Mademoiselle Y is having an affair with the former’s husband. Allison Bell premiered the staged version at the inaugural London Contemporary Music Festival in 2013. Soundstream presents the Australian premiere, and the World premiere of the version for soprano and piano, with blessings from the composer. Tasmanian born Soprano Allison Bell is one of the leading performers of 20th and 21st century music of her generation. Notable performances include Sierva in Eotvos’s Love and Other Demons at Glyndebourne, Schnittke’s Three Scenes, Madrigals, Der Gelbe Klang at the Royal Festival Hall, Schoenberg’s Pierrot Lunaire at the Wigmore Hall, Grisey’s Quatre chants pour franchir le seuil and Polly in Weill’s Dreigroschenoper at the RFH/Théâtre des Champs-Élysées, all with the London Philharmonic Orchestra/Vladimir Jurowski. Also Gorecki’s Third Symphony with the LPO/Dworzynski, Le Feu/La Princesse/Le Rossignol (L’Enfant et les Sortilèges) at the Bolshoi, works by Schoenberg and Dean at the Concertgebouw, Pierrot Lunaire at the Edinburgh Festival and Moscow’s Mossovet Theatre, Ravel’s Shéhérazade with the Iceland Symphony Orchestra, Ligeti’s Mysteries of the Macabre and Chin’s Akrostichon Wortspiel with the TSO. More recently and upcoming, Berg’s Lulu Suite with the Russian State Symphony Orchestra/Jurowski at Tchaikovsky Concert Hall, Tavener’s Flood of Beauty and Andriessen’s Dances with the Britten Sinfonia at the Barbican, works by Vivier and Donatoni with BCMG, an acclaimed recording of Brett Dean’s String Quartet no 2 as well as the world premiere of Dean’s From Melodious Lay and Rodney-Bennett’s Spells with the BBC Symphony Orchestra at the Barbican. 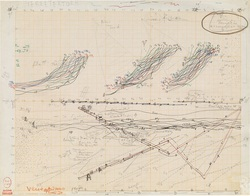 The Sketch by Xenakis that inspired this piece. Stella Degredation is inspired by a sketch Iannis Xenakis made for his piece Terretektorh (1956-66). Whilst there are many sketches for this famous piece, one is a combination of clouds of gentle lines, as well as hard symmetrical ones, grouped out on graph paper. This piece features many of the elements that are part of my ongoing interest in glissandi, drone, noise and an exploration of the concepts around the low frequency range of music. 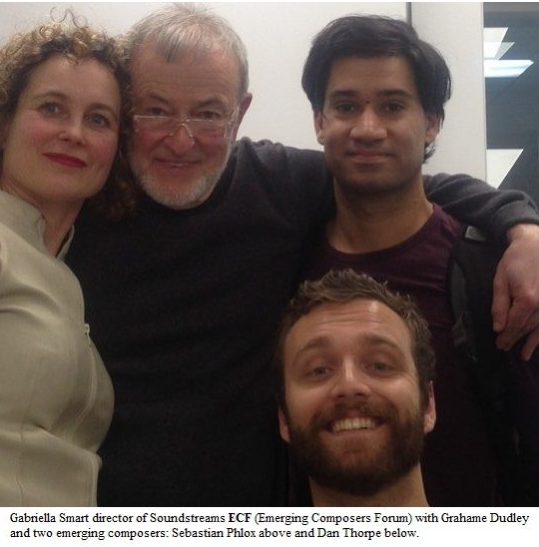 It was commissioned by the SoundStream Collective and is dedicated to Gabriella Smart. Stella Degradation distills contemporary language through assimilating everyday technology with cutting edge, improvised sonic geometry. Here, the performers read graphic notation on iPads. Duo version premiered at Samstag Museum of Art as part of Crowd Theory Adelaide, by Canadian’s Eric Soucy (viola) and Peter Handsworth (clarinet). “Cat Hope’s 2012 Stella Degradation explored sound and noise at their most visceral and with its echoes of Xenakis evoked a wonderfully decadent blast from the past, although composed for the present. After so many years of postmodernism it was quite refreshing to soak up once more the extended technique sounds redolent of the 1960s, even if Soucy and Handsworth were using up-to-the-minute technology, with a tablet on their shared music desk scrolling along its graphic notation for them.” Adelaide Now. Following its world premiere by Finland’s defunensemble at the 2017 Musica Nova Helsinki, Soundstream performs the Australian premiere of The Continuity Hypothesis by Erkki Veltheim, with Erkki generating the live electronics on stage. It continues Veltheim’s interest in the acquisition and construction of language(s), and the relationship of these processes to the semiotics of musical composition and performance. The title refers to the hypothesis that infants’ babbling (ie. the nonsensical reduplication of basic phonemes) is a constitutive part in first language acquisition, leading to the construction of intelligible linguistic units through a combination of innate and social feedback mechanisms. The musical equivalent of this hypothesis is reflected in the pianist performing Bach on a keyboard sampler, which translates as a series of seemingly disconnected, but coherent, sounds. The ‘babbling’ in my composition will consist of musical materials that could be thought of as operating on the level of phonemes, the smallest meaningful units of language. Each instrumentalist will be given a vocabulary of short musical gestures that mimic the phonemes observed in infantile babbling, adapted for each instrument through specific techniques such as slap-tongues for the bass clarinet, muted pizzicati for the cello, and sampled sounds on the keyboard. Decalogue – Ten Vignettes from Gorecki to Grime. Please join us in a concert by distinguished mezzo soprano, Elizabeth Campbell and pianist, Gabriella Smart. The afternoon with be a rare opportunity for music enthusiasts to hear a sublime collection of lieder and classical songs. The venue is the beautiful Carclew House which is rarely opened for public concerts. Selected lieder by Schubert and favourite songs by Australian composers Ross Edwards, Shauna Beesley and Vincent Plush. Canapés and fine wines by Simon Hackett and James Erskine will be served. The Soundstream Lieder Recital Series was established to raise funds to assist Australian composers through its Emerging Composers Forum. It has raised the profile and commissioned 15 young composers since its establishment in 2012 in collaboration with ABC Classic FM who have broadcast its performances to audiences of over a million via national radio. Tone List Collective is Jameson Feakes (electric guitar), Sage Pbbbt (voice), Dan O’Connor (trumpet), Shoshana Rosenberg (bass clarinet), Josten Myburgh (electronics). 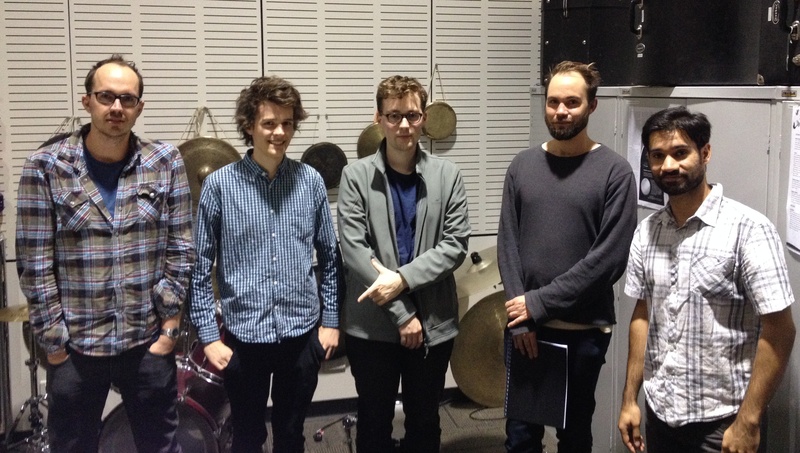 As part of their eclectic March tour program, members of record label Tone List present chamber performances of newly commissioned works, experimental repertoire and prepared improvisations. Featuring new works by the Perth-based Dan O’Connor & Olivia Davies, Melbourne composer Simon Charles, and Adelaide-based Shoshana Rosenberg, as well as pieces from American composer Michael Pisaro’s harmony series, these pieces explore emerging perspectives on vulnerability and silence, and their political implications. They investigate means of scoring which can invite the participation of those with differing musical backgrounds, as well as performer-composer approaches, leading to works which are deeply engaged with the intimate relationships between performers, and between performers and their instruments. The resulting sound worlds are intimate, fragile, often contemplative, but occasionally confronting. Josten Myburgh is a composer, organiser and performer based in Perth. He studied with Antoine Beuger, Stuart James and Lindsay Vickery. He is interested in generosity, vulnerability and passivity and their political implications within performance and within community. He has performed at Krakow AudioArt Festival, Cable#8 Festival in Nantes, Klangraum Festival in Düsseldorf and the Totally Huge New Music Festival in Perth. Jameson Feakes is a guitarist and improvisor. He is engaged in new music performance with GreyWing Ensemble, Breaking Waves, and in duo with Josten Myburgh in Perth, as well as improvising solo and with the free jazz group ßß (eszetts). His guitar playing explores physicality, endurance, harmony and silence. Shoshana Rosenberg is a queer, Jewish, eternal novice. Through experiments with the bass clarinet in meditation, chanting and traditional Klezmer music, she seeks to explore harmony and space. In her cultivation of transparent relationships with audiences, Shoshana allows witness to her increasingly complex dialogue between player and instrument, with all its failures and successes. Dan O’Connor is a trumpet player and improvisor. He is a highly active experimental musician in Western Australia, working with the ensembles Gerygone, Breaking Waves, ßß (eszetts), Lee/Jacobs/O’Connor and more, and has performed in almost every experimental music venue and series. He is the initiator of the Tone List label and curates the Outlines series for new collaborations in improvised music, and the Residence series, inviting performers to explore a specific part of their practice in his studio over a number of consecutive concert evenings. Sage Pbbbt is an experimental vocalist based in Western Australia, actively performing as part of the new music and improvised music scenes. 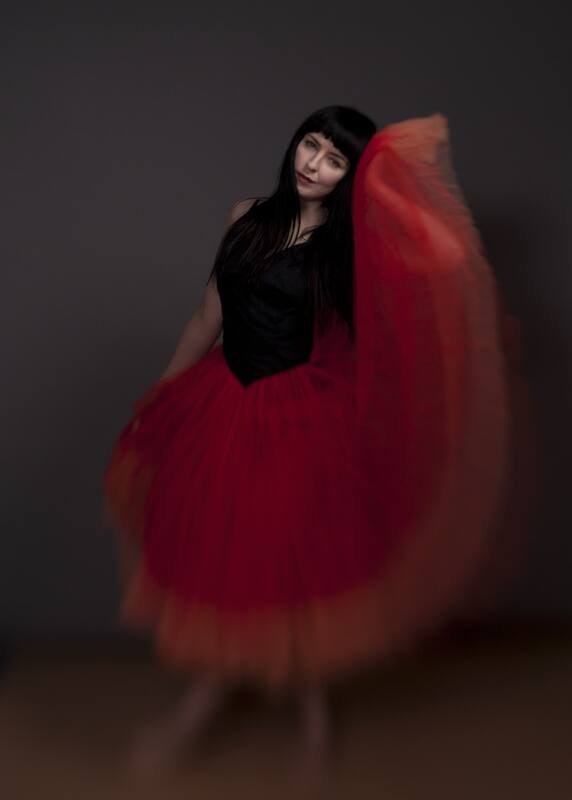 Her singing practice takes inspiration from Tuvan and Mongolian overtone singing, Inuit throat singing, sound poetry and an ongoing exploration of extra-normal vocal technique. She also take influence from industrial musick, trance, and drone; insight meditation practice, urban/industrial shamanism and chaos magick; feminist, queer and trans praxis; and Discordianism. Emerging Composers Forum WRAP UP! 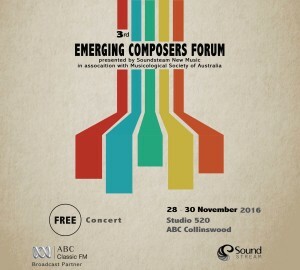 The third edition of the Emerging Composers Forum wrapped on Wednesday 30 November. After an intensive and inspiring thee days of workshops and rehearsals the final concert offered a glimpse of what the future holds say music critic Graham Strahle in The Australian. Congratulations to all five finalists Mark Wolf, Leah Blankendaal, Dan Thorpe, Alex Turley and Mitchell Mollison. Three commissions of $5000 each were awarded to Leah Blankendaal, Dan Thorpe and Mitchell Mollison. A huge thanks to the four mentors Cat Hope, Alison Isadora, Gao Ping and Simon Emmerson. Also to ABC Classic FM for hosting the Forum at Studio 520. Stay tuned for details on when the concert will be broadcast. 2016 Soundstream Emerging Composers Forum IS COMING! 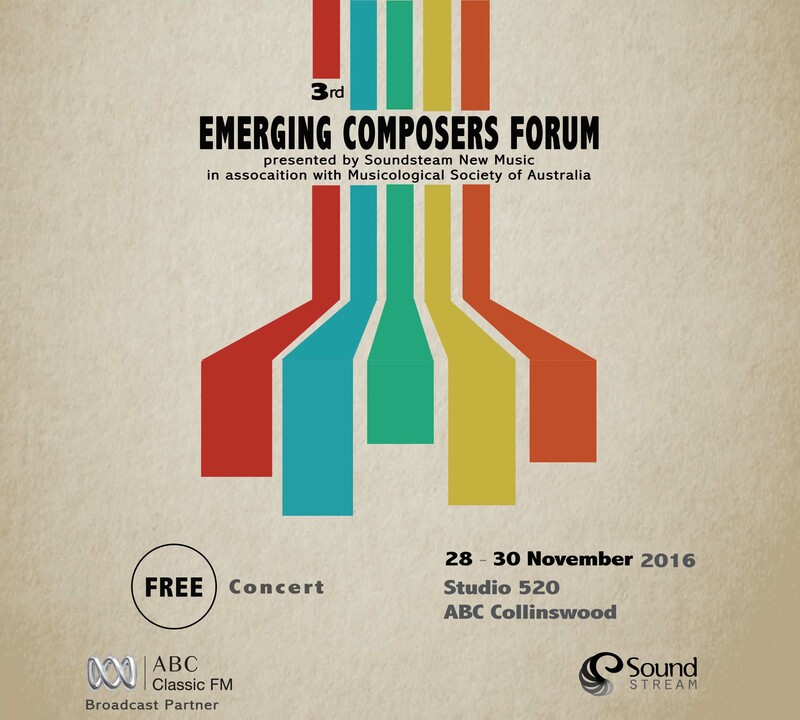 The Soundstream Emerging Composers Forum is open to all Australian composers residing around the world in their first five years of professional practice, or studying at Postgraduate level. The selected composers are flown to Adelaide to participate in open rehearsals of their work, workshops and lectures by the mentoring composers and with guest Professor Simon Emmerson, Music, Technology and Innovation, Leicester Media School, Faculty of Technology De Montfort University (UK). 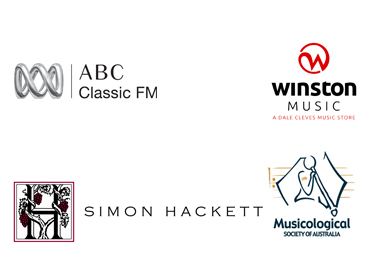 At the final concert, broadcast by Partner ABC Classic FM, three commissions of $5000 each will be offered. 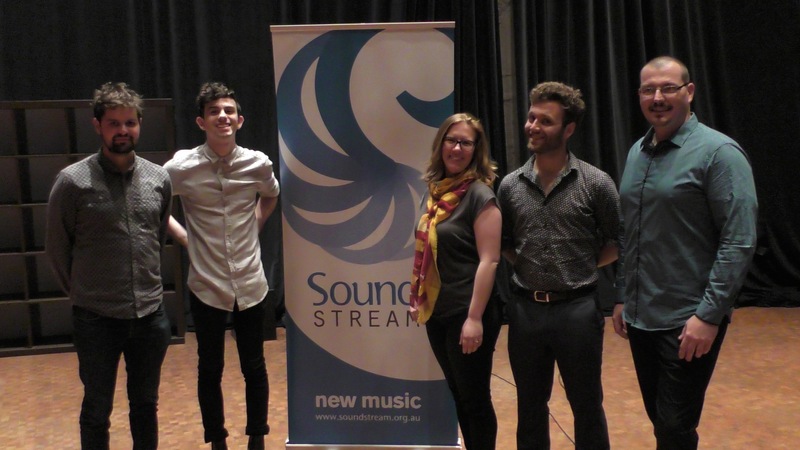 Soundstream Emerging Composers Forum, presented by Soundstream in association with the Musicological Society of Australia and our broadcast partner ABC Radio. Concert: Wednesday November 30, 7.30pm, Studio 520, ABC Collinswood. Radio Adelaide – This is the major event of the year for new music. DON’T MISS IT. Simon Emmerson came to De Montfort as Research Professor in November 2004 after many years as Electroacoustic Music Studio Director at City University, London. He originally studied sciences and music education at Cambridge before completing a PhD in Electronic Music at City. As a composer he is committed to live performance with electronics and has now forty years of work reflecting the changing technology of music; commissions include works for the Smith Quartet, Philip Sheppard (electric cello), Philip Mead (piano) with the Royal Northern College of Music Brass Quintet, Darragh Morgan (violin) and Keynote+ (Jane Chapman and Kate Ryder – harpsichord and piano). He has also completed purely electroacoustic commissions from the IMEB (Bourges), the GRM (Paris) and the Inventionen Festival (Berlin). CDs of his works have been issued by Continuum (1993) and Sargasso (2007 and 2008). He contributed to and edited The Language of Electroacoustic Music in 1986 (Macmillan, still in print) and Music, Electronic Media and Culture (Ashgate, 2000). His book Living Electronic Music was published by Ashgate in 2007. He has also contributed to Computer Music Journal, Contemporary Music Review and the Journal of New Music Research. He was founder Secretary of EMAS (The Electroacoustic Music Association of Great Britain) in 1979, and served on the Board of Sonic Arts Network from its inception until 2004. He is a Trustee of its successor organisation ‘Sound and Music’. In 2009-2010 he was DAAD Edgar Varese Visiting Professor at the TU, Berlin. In the summer of 2011 he gave the keynote addresses at the Australasian Computer Music Conference (Auckland) and the International Computer Music Conference (Huddersfield). Born and bred in Aotearoa/New Zealand Alison Isadora (1962) studied political philosophy and music at the Victoria University of Wellington (NZ), before moving to the Netherlands in 1986 primarily to study violin (with Vera Beths) and thereafter composition (Gilius van Bergeijk and Theo Loevendie) at The Hague Conservatorium (1994, with distinction) and post-graduate performance theater at DasArts in Amsterdam. She has been a performing composer or a composing performer within numerous Dutch groups including Hex, Gending, Nieuw Ensemble, the Maarten Altena Ensemble and the multi-medi duo SYNC. Her works have been performed by diverse ensembles in the Pacific, Europe and North America including Ensemble Klang, David Kweksilber Big Band, Matangi Strijkkwartet, Nederlands Blazers Ensemble, Array Ensemble (Canada) and STROMA Ensemble (NZ). As well as composing for music ensembles, Isadora also creates music-theatre performances, audio walks and installations. In the last years she has become increasingly interested in the possibilities of connecting music to other disciplines. Isadora’s works often incorporate elements of story-telling and participation while addressing social issues. In her capacity as music educator Isadora has explored elements of sound and composition with dance, choreography and theatre students at ArtEZ Institute of the Arts in Arnhem (NL). In 2016-2017 Isadora is the Creative New Zealand/Jack C. Richards Composer-in-Residence at Te Kōkī New Zealand School of Music. Cat Hope’s music is conceptually driven, using mostly graphic scores, acoustic /electronic combinations and new score reading technologies. It often features aleatoric elements, drone, noise, glissandi and an ongoing fascination with low frequency sound. Her composed music ranges from works for laptop duet to orchestra, with a focus on chamber works, and in 2013 she was awarded a Churchill Fellowship to develop her work, as well as Civitella Ranieri (Italy) and Visby International Composers residency (Sweden) fellowships. Her practice explores the physicality of sound in different media, and has been discussed in books such as Loading the Silence (Kouvaris, 2013), Women of Note (Appleby, 2012), Sounding Postmodernism (Bennett, 2011) as well as periodicals such as The Wire, Limelight,and Neu Zeitschrift Fur Musik Shaft Her works have been recorded for Australian, German and Austrian national radio, and her work has been awarded a range of prizes including the APRA|AMC Award for Excellence in Experimental Music in 2011, 2014 and the Peggy Glanville Hicks composer residency in 2014. She has founded a number of groups, most recently Decibel new music ensemble, noise improv duo Candied Limbs and the Abe Sada bass project. She has also founded and written pop songs for Gata Negra (1999-2006). The son of musician parents, GAO Ping was born in Chengdu, in the Chinese province of Sichuan, in 1970. He studied piano and composition in Beijing, and then in the USA where he took his Doctorate in Musical Arts at the College-Conservatory of Music in Cincinnati. For several years from 2004 he taught at Canterbury University in Christchurch, New Zealand. In the ensuing decade, he developed significant ties between China, New Zealand and Australia. More recently, Dr Gao has returned to Beijing where he is currently Head of Composition at the Conservatory of Music – Capital Normal University, as well as composer-in-residence with the Forbidden City Chamber Orchestra, an ensemble of musicians who play mainly new compositions on traditional Chinese instruments. Two albums of his music on the Naxos label have received critical acclaim. A critic with the international music journal Percorsi musicali described him as “one of the most important composers to emerge from China in recent years”. Increasingly in demand as composer, pianist, teacher and lecturer, Dr Gao has received many prestigious commissions, performances and awards from noted performers, venues and festivals around the world. His music draws its inspiration from the folklore of his native China, from ancient Chinese poetry and the oral tradition of story-telling from his childhood in Sichuan. “I have always thought of myself as a story-teller of sorts,” he has written, “but in place of words, I use music.” Many of his pieces for solo piano required the player to sing, hum and vocalize, and play prepared piano and other percussion instruments. Habitually, his pieces comprise a mélange of Chopin and Shostakovich, popular Chinese song and post-Mao revolutionary music.